Residential property prices in Singapore will decline during the coming two months as market sentiment remains muted. The first three months of 2015 saw 1,311 new private residential units transacted, according to new research from real estate firm Knight Frank, marking the lowest volume in a quarter since Q4 2008 when 706 new units were sold. Overall private home prices fell for the sixth consecutive quarter, declining by 1 per cent quarter-on-quarter (q-o-q) in Q1 2015. Prices are expected to decline further by between 3 and 4 percent during the whole of 2015, the agency said. Developers launched 1,189 new private residential units in Q1 2015, representing a 25.3 percent q-o-q decrease. Similarly new sales in Q1 2015 fell by 4.7 percent q-o-q to 1,311 units. In terms of new units launched, the quarterly island-wide fall is mainly attributed to the Core Central Region (CCR) which saw a significant 98.2 percent q-o-q decline to 17 units. The quarterly island-wide decrease in new sales is also the most pronounced in the CCR, with the number of new units sold falling by 82.9 percent q-o-q to 80 units. “The housing market is still weighed down by government cooling measures and expected rate hikes. Most new launches seem to have settled into a pattern of a strong initial flurry of sales, followed by a standstill until something new occurs,” said Tay Kah Poh, Executive Director and Head, Residential Services for Knight Frank Singapore. 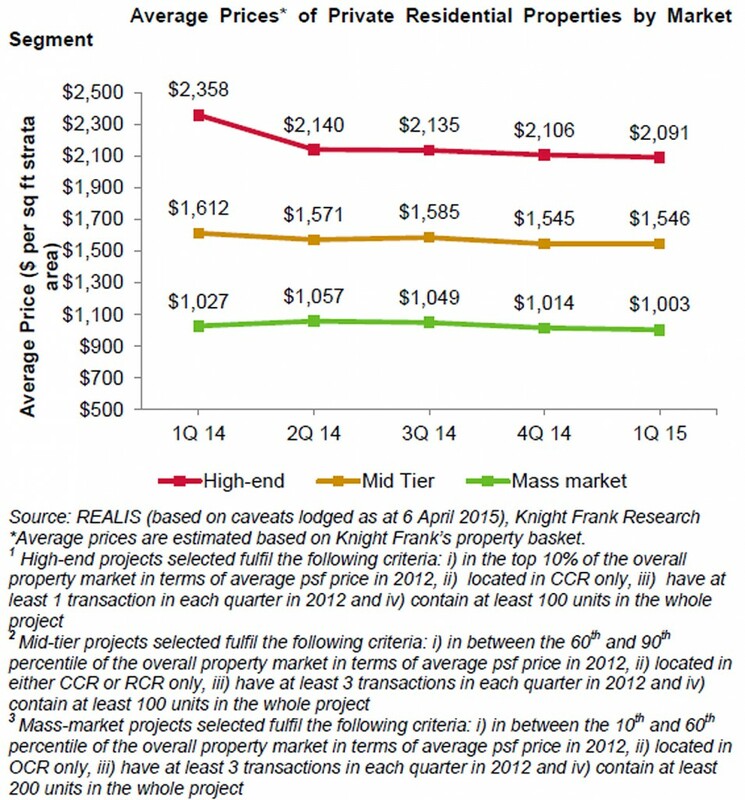 Based on analysis of Knight Frank’s basket of private residential properties, the prices of high-end and mass-market properties continue to weaken in Q1 2015, while the mid-tier market recorded a slight price rebound. Average property prices in the mass-market segment declined by 1.1 percent q-o-q to S$1,003 per sq ft during Q1 2015, marking the third consecutive quarter of decline. Such downward price trends are a result of the huge unsold stock in the mass-market segment and the sustained weakening in the HDB resale market affecting upgraders’ demand for private housing, Knight Frank reported. At the same time, average prices of high-end homes fell on a quarterly basis, declining by 0.7 percent q-o-q to S$2,091 per sq ft during Q1 2015. With the ongoing implementation of strict loan curbs and fears over further price declines, high-end property home-owners being urged to lower their price expectations in order to sell their units, the agency said. In contrast, the mid-tier market recorded a “fairly resilient” performance, with prices averaging S$1,546 per sq ft in Q1 2015. This marks a marginal 0.1 percent q-o-q increase, and reverses the decline in average prices from the previous quarter. By virtue of location and proximity to the city centre, mid-tier homes remained well sought-after and are likely to be seen as value-buys by potential home-buyers moving forward, it said. With the increase in average capital value and fall in average rentals, gross yields of mid-tier market properties moderated to approximately 3.5 percent in Q1 2015. Gross yields of mass-market properties inched up to about 3.7 percent during Q1 2015, marking a second consecutive quarter of increase. On an even more positive note, according to Knight Frank, for high-end market investors gross yields in the luxury segment rose to 3.1 percent during Q1 2015, which represents a notable rebound after two consecutive quarters of decline. “Juxtaposed with the muted market sentiment, developers are expected to moderate prices and introduce attractive product positioning for their new launches,” the agency said it its latest research report. “Home-buying sentiment could be impacted by probable interest rate hikes, and the potentially slower global economic growth could also impact Singapore as well as raise uncertainty in economic prospects and market demand. In summary, the agency reported: “The private housing market is still weighed down by government cooling measures and expected rate hikes. Most new launches seem to have settled into a pattern of a strong initial flurry of sales, followed by a standstill until something new occurs – such as another nearby launch, developers offering new incentives and fresh marketing campaigns. Urban Redevelopment Authority’s (URA) flash estimate of private residential property price index shows prices rising 0.8 per cent in second quarter of 2013. The private residential property index rose 1.7 points from 213.2 points in 1st quarter 2013 to 214.9 points in 2nd quarter 2013. URA said prices of non-landed private residential properties in Core Central Region declined by 0.2 per cent in 2nd quarter 2013. In the previous quarter, it increased by 0.6 per cent. Prices in Rest of Central Region saw the same 0.2 per cent rate of increase as the previous quarter. For Outside Central Region, prices increased by 3 per cent in 2nd quarter 2013. It was 1.4 per cent in the previous quarter. URA will release the full real estate figures for 2nd quarter 2013 in four weeks’ time.